Decorated or Personalised Mini Heart Cookies. A great way to tell someone you love them! Take a look and get yours personalised today! 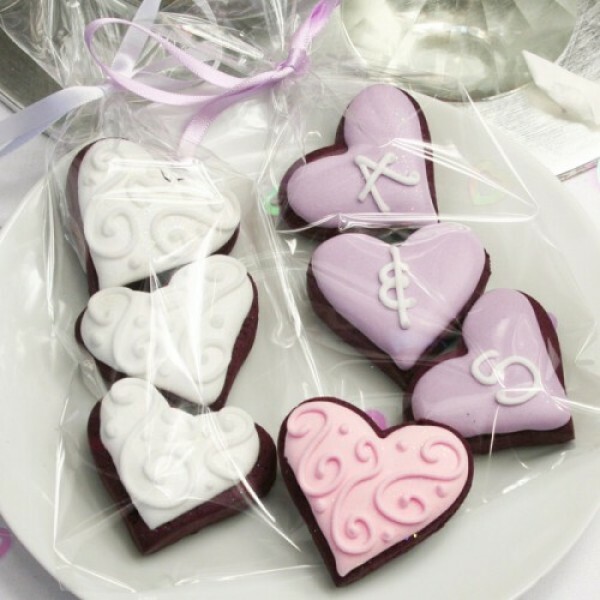 These beautiful decorated mini heart cookies are ideal for engagement and wedding gifts. Whether you’re popping the question, announcing your engagement or thanking guests for attending your wedding, these customisable cookies can be the icing on the cake to your special announcement. Includes one letter or symbol per heart cookie; or swirl decoration as shown. If further/ different personalisation or decoration is required please email alli@customcookieco.co.uk. Powder, Whole Egg, Vanilla Extract, Ground Ginger & Ground Cinnamon; Salt, Dried Egg White, Maize Starch, Glycerine, Glucose Syrup and some of the following Colours E102, E104, E122, E124, E129, E133, E155 & E151* *Colours present vary depending on design and type of icing used. The food colours that we use are dissolved in 'carriers' which may be present in trace quantities. These carriers comprise Alcohol, Glycerol, Propylene Glycol, Silicon Dioxide, Stabilisers (Carboxymethyl Cellulose, Guar Gum) Emulsifier (Polysorbate 80) and Citric Acid. Cookies contain allergens Wheat (Gluten), Milk and Egg. Cookies are made in a bakery where Nuts and Soya are also handled.